← Can a believer pray to Allah and be saved? Many people proclaim to be followers of the one true God. The most important command in the text is located where? Do you know it by heart? 1) How man NFL players can you name . . . . – – – How many talmidim (disciples)? 2) How many secular songs do you know the lyrics to? – – – How many biblical songs (Psalms) do you know the lyrics to? 3) How many of you know where to buy a Powerball or where the Casinos are? – – – How many of you know where the two most important commands in the text are? We can say He is the MOST IMPORTANT . . . .
our ACTIONS match what our MOUTH proclaims . . .
otherwise, it is just talk . . . 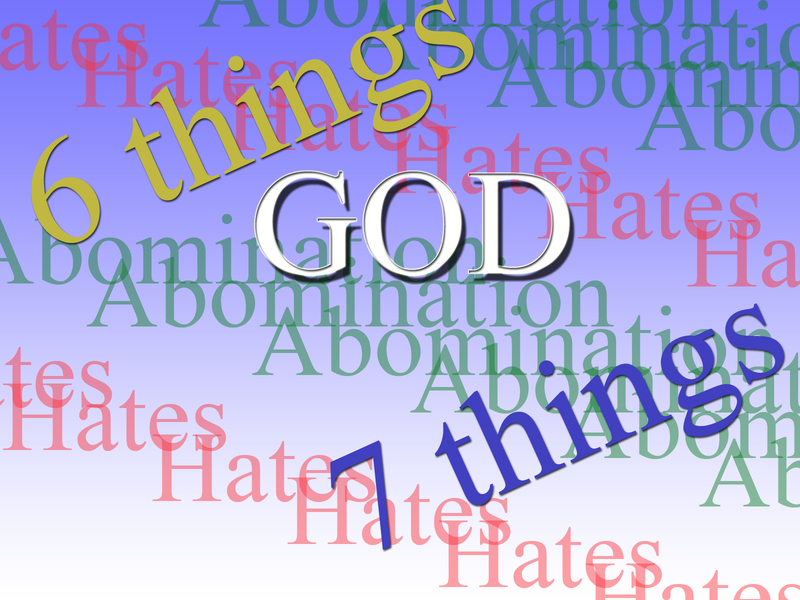 The Lord hates 6 things – detests 7 things. Shouldn’t we know these 6 and 7 things by heart as well? Is there any reasonable reason for NOT KNOWING what these things are by heart? If you know the 2 most important commands, GREAT! Praise Adonai!!! If you know the 7 things God detests, again GREAT! Praise Adonai! If not, it may be time to take a serious inventory of what you actually believe . . .
With this in mind, I present the following with no commentary from me (I have bolded and underlined a few things though 😛 ) . . . just the text, an interlinear and dictionary entries so that you can see, learn and study what the 6 things that Adonai hates are and the 7 things that He detests. Meaning “to hate,” sānﬁʾ expresses an emotional attitude toward someone or something which is abhorred, disdained or opposed, and with which a person desires to have no relationship or amiable reconciliation. The Lord prohibited the expression or attitude of hatred toward a brother (Lev. 19:17). . .
Leviticus 19:17 (CJB) 17 “‘Do not hate your brother in your heart, but rebuke your neighbor frankly, so that you won’t carry sin because of him. Instances of morally justified hatred or disdain between people are recorded in Scripture. For example, David declared, “I have hated the congregation of evildoers; and will not sit with the wicked” (Ps. 26:5; cf. Pss. 31:6; 119:113; 139:21f). . .
Psalm 26:5 (CJB) 5 I hate the company of evildoers, I will not sit with the wicked. Psalm 31:6 (CJB) 6 I hate those who serve worthless idols; as for me, I trust in Adonai. Psalm 119:113 (CJB) 113 I hate doubleminded people, but I love your Torah. Psalm 139:21 (CJB) 21 Adonai, how I hate those who hate you! I feel such disgust with those who defy you! The Lord can also rightly hate or despise a variety of things, such as objects symbolic of idolatry (Deut. 16:22), acts of pagan worship (12:31), evil and those who love violence (Ps. 11:5), bloodthirsty and deceitful men (5:5), those who commit evil deeds (Hos. 9:15) and divorce (Mal. 2:16). . . Hate is the opposite of love (ʾāhﬁv, HED #154), and these terms are found in direct contrast to one another on several occasions. Ecclesiastes 3 contains a list which teaches that there is a time for every activity under heaven including, “a time to love, and a time to hate.” After Amnon raped Tamar, he hated her more intensely than he had lustfully loved her originally (2 Sam. 13:15). Also, those who love the Lord hate evil (Ps. 97:10), those who hate good love evil (Mic. 3:2) and the one who loves the law of God hates falsehood (Ps. 119:163). . .
Thoralf Gilbrant, ed., “7983,” in The Complete Biblical Library Hebrew-English Dictionary – Sin-Taw, (Springfield, IL: World Library Press, Inc., 1998), WORDsearch CROSS e-book, Under: “7983”. The word is primarily used of things, persons or practices that are either ritually or morally offensive to the Lord. From an Egyptian point of view, however, several things are abominable: eating with Hebrews, the profession of shepherding (Gen. 43:32; 46:34) and sacrifices made to the Lord (Exo. 8:26). The laws of the Pentateuch taught Israel what was abominable to the Lord. In general, these consisted of Canaanite customs including a wide range of sexual offenses, specifically homosexuality (Lev. 18:22; 20:13). The expression “abomination to the Lord“ indicates anything that could spoil the religious purity of the people. sacrificing children by fire in the worship of other gods (12:31). Thoralf Gilbrant, ed., “8774,” in The Complete Biblical Library Hebrew-English Dictionary – Sin-Taw, (Springfield, IL: World Library Press, Inc., 1998), WORDsearch CROSS e-book, Under: “8774”. Metaphorical usage of rûm shows the heart lifted up, which indicates pride. Moses admonished Israel not to be proud when all God’s blessings became fulfilled (Deut. 8:13f). Moses further exhorted rulers and leaders, who served as examples for everyone else, to resist pride and not allow their hearts to be lifted up above their brethren (Deut. 17:20). Rulers were given power to serve God and his people the way He wanted them to. Eyes are lifted up, which describes haughtiness or self-righteousness (Prov. 30:13), usually by those who hold high social rank. Thoralf Gilbrant, ed., “7597,” in The Complete Biblical Library Hebrew-English Dictionary – Pe-Resh, (Springfield, IL: World Library Press, Inc., 1998), WORDsearch CROSS e-book, Under: “7597”. The eyes were thought to be capable of revealing the inner man, or his mental or emotional state. Proverbs 22:9 speaks of a generous person as one having a “bountiful eye.” A selfish person is said to have an “evil eye” in Prov. 23:6. A proud look (literally a “proud eye”) is listed as one of the things the Lord hates in Prov. 6:17. Job 22:29 says that God will save the humble person, or the “person of a humble look.” A mocking eye will be picked out by ravens according to Prov. 30:17. Ezekiel 16:5 speaks of a pitying eye, while Deut. 7:16 speaks of one without compassion. The same may be expressed by an “evil eye” as in Deut. 15:9. The eye may also be used to express man’s desire (Num. 15:39). Thoralf Gilbrant, ed., “6084,” in The Complete Biblical Library Hebrew-English Dictionary – Nun-Ayin, (Springfield, IL: World Library Press, Inc., 1998), WORDsearch CROSS e-book, Under: “6084”. A masculine noun derived from shāqar (HED #8631), “to deal deceitfully,” sheqer occurs over 110 times in the OT. The word is used to describe words or activities that are “false,” in the sense of being without basis in fact or reality. For example, David spoke of those who were his enemies without cause (Pss. 35:19; 38:19). Sheqer is used with particular reference to false testimony, as in court. God considered it such a serious sin to give testimony ungrounded in truth that He forbids it in the Ten Commandments (Exo. 20:16), as well as elsewhere (Deut. 19:18). Zechariah warned against false oaths or perjury (Zech. 5:4; 8:17); Jeremiah prohibited swearing falsely (Jer. 5:2). Such deceit is listed in Psalms as the act of an adversary (Ps. 27:12), motivated by arrogance (119:69). The purpose is to destroy someone through slanderous words (Isa. 32:7). Isaiah 32:7 (CJB) 7 The mean person’s means are mean — he devises wicked devices to ruin the poor and needy with lies, even when their cause is just. The OT focuses much attention on false prophets, who proclaimed self-generated messages with no foundation in revelation from God. The Book of Jeremiah contains numerous passages exposing the wickedness of such deceitful men (Jer. 14:14; 20:6; 23:14, 25f; 27:14ff; 29:9, 21). They proclaimed their dreams, founded on nothing but their own imaginations (23:32). They were merely eager to gain for themselves, pronouncing oracles of hope and prosperity when peace was not on the horizon (8:10f). Jeremiah noted in disbelief that the people loved those who taught falsehood (5:31; 27:10). They actually preferred prophets whose way of life was wind and lies (Mic. 2:11). Isaiah and Zechariah also mentioned teachers of error (Isa. 9:15; Zech. 10:2; 13:3). The true basis of their message was revealed when Micaiah the prophet told King Ahab that a lying spirit was functioning through the mouth of his prophets to lure him to his death (1 Ki. 22:22). Idols were also described as deceptions, for people worshiped them even though the idols had no life in them (Jer. 10:14f). They were described as teachers of falsehood because of the empty promises associated with them. A person who makes an idol carries a lie in his hand and is too deluded to realize that there are no grounds for worship; it is a piece of stone or wood (Isa. 44:20; Jer. 51:17; Hab 2:18). Lies most commonly take the form of willfully inaccurate words, often described as lying lips or lying tongues. Such deceit is one of the seven things God hates (Prov. 6:17), and He warns that such lies only achieve their objectives for a short time (12:19; 21:6). Deceptive speech is often connected with hatred (10:18; 26:28) and animosity (Ps. 109:2). Those who are righteous reject falsehood (Prov. 13:5) and pray to be delivered from it (Ps. 120:2). Falsehood is particularly reprehensible for a leader (Prov. 17:7), and David declared that no one guilty of it could serve him (Ps. 101:7). At times, deception can be expressed in actions, rather than words. God described Israel as a nation of thieves, who took what they wanted, even though they had no basis for claiming ownership (Hos. 7:1). In addition, the soldier who reported Absalom’s fatal predicament to Joab protested that it would be an act of treachery to kill the young man in the face of King David’s orders (2 Sam. 18:13). The psalmist spoke of those who persecute the godly with no solid grounds for their actions (Ps. 119:78, 86). The prophets accused Judah of deception, calling them “offspring of deceit.” Not only had the Jews fooled men, but they had falsely promised God that they would turn to Him with their whole heart (Jer. 3:10). Jeremiah 3:10 (CJB) 10 Yet in spite of all this, her unfaithful sister Y’hudah has not returned to me wholeheartedly; she only makes a pretense of it,” said Adonai. Thoralf Gilbrant, ed., “8632,” in The Complete Biblical Library Hebrew-English Dictionary – Sin-Taw, (Springfield, IL: World Library Press, Inc., 1998), WORDsearch CROSS e-book, Under: “8632”. The first occurrence of the word for blood in the Bible is in a murder scene in Gen. 4:10. It is pictured as calling out to God for punishment of its murderer. Cain had taken Abel’s life unjustly and that guilt required justice. Many of the Bible usages of the word blood refer to murder or at least violence against another human being, such as Ps. 5:6, which literally says “man of bloods” (where the NIV has “bloodthirsty”), 2 Sam. 16:7-8 or Ezek. 7:23. Blood is never used in a context of a peaceful death because the association with death involves some kind of wound which causes the loss of blood and therefore the loss of life. Shedding or pouring out blood is not a natural act, but an act of violence. God holds people accountable for all mistreatment of other people. The more serious the violence against another, the more serious the punishment, including death for murder (Gen. 9:5-6). to be responsible for his own death because of his guilt, Lev. 20:9, Ezek. 18:13, or someone elses death through negligence or disobedience, Ezek. 33:6. In Numbers 35:19 and following, the murderer is to be put to death by the avenger of blood. However, taking the life of a person unjustly is shedding or pouring out innocent blood (Deut. 19:13) and must be dealt with. This common use of blood in negative contexts reminds humanity of our sinful condition and condemnation to death without God’s intervention. Thoralf Gilbrant, ed., “1879,” in The Complete Biblical Library Hebrew-English Dictionary – Gimel-Zayin, (Springfield, IL: World Library Press, Inc., 1998), WORDsearch CROSS e-book, Under: “1879”. It is here that one’s moods (Judg. 16:15) and conscience (Isa. 59:13) are centered. are located in the heart. given that knowledge is tied to devotion to Yahweh and his laws (cf. Prov. 1:7). Proverbs 1:7 (CJB) 7 The fear of Adonai is the beginning of knowledge, but fools despise wisdom and discipline. It is Yahweh Who gives one a heart for understanding (Deut. 29:4). Lﬁv, therefore, can often be translated by the English concept of the “mind” as the center of intellectual activity. A wise person is one with a “lﬁv of wisdom” (Prov. 10:8), “a listening lﬁv” (1 Kings 3:9), or “a wide lﬁv” (1 Kings 4:29), while a mindless person “has no lﬁv” (Prov. 17:16). Proverbs 17:16 (CJB) 16 Why would a fool wish to pay for wisdom when he has no desire to learn? Inclinations are expressed through the heart (again, best translated as “mind”). all find their locus in the heart; as does discouragement (Jer. 4:9); and belief (2 Sam. 13:33). A “double heart” means deceitfulness (Ps. 12:2). A defiant or stubborn attitude is expressed by in the imagery of a “hardened heart” (Exo. 7:13). An extension of this concept is a “heart of stone,” one which Yahweh will one day replace with a heart of flesh (Ezek. 11:19). Yahweh “will write [the Law] upon their hearts” (Jer. 31:33). Yahweh was compelled to destroy humanity because every thought of their hearts was continually upon sin (Gen. 6:5). Indeed, this response to the heart of humans “grieved [Yahweh] to the heart” (v. 6). Repentance is characterized as “returning the heart” (1 Sam. 7:3). A common phrase in Deuteronomy is “with all the heart and soul” (Deut. 4:29), which emphatically declares that we must give all to Yahweh. Thoralf Gilbrant, ed., “3949,” in The Complete Biblical Library Hebrew-English Dictionary – Kaph-Mem, (Springfield, IL: World Library Press, Inc., 1998), WORDsearch CROSS e-book, Under: “3949”. The word occurs about 75 times in the OT, mostly in Psalms (29 times), Job (12 times), Isaiah (12 times) and Proverbs (9 times). It occurs primarily as a noun and has a variety of nuances, including “trouble,” “wickedness,” “evil” and “idolatry . . .
. . . the word is used as a term for “sin” or “evil” generally. but the wicked are followed by trouble (Prov. 12:21; 21:15; 22:8). The Psalms agree that the face of the Lord is against them that do evil (5:5; 6:8). Therefore, calamity will often come their way (Ps. 36:12). The prophecies of Isaiah point to certain judgment for those who do evil (Isa. 29:20; 31:2). Furthermore, Hosea notes wicked Gilead as an example of what happens to those who turn from serving Him (Hos. 12:11). If someone hides sin in his heart, God does not listen to him (Ps. 66:18). Occasionally, the psalmist sought help in remaining free from sin, turning both to the commandments of God (Ps. 119:33) as well as refraining from eating the delicacies of evildoers (Ps. 141:4). Prophets employ the term signifying injustice (Isa. 10:1; Hab 1:3) or violence (Isa. 59:6-7; Hos 6:8). At times, the wicked are said to be engaged in plotting or scheming evil (Ps. 36:4; Prov. 6:18; Isa. 32:6-7; Ezek. 11:2). Finally, the Lord will forgive the wicked, if they repent, and turn from their ways unto the Lord (Isa. 55:7; 58:9). Isaiah 55:7 (CJB) 7 Let the wicked person abandon his way and the evil person his thoughts; let him return to Adonai, and he will have mercy on him; let him return to our God, for he will freely forgive. usually of the deceitful quality. At times deceit and ʾāwen appear to be parallel concepts (Job 11:11; 15:35; Ps. 55:10). In Ps. 10:7, the wicked man’s mouth is full of curses, lies, threats, trouble and evil. We also find that the wicked may speak cordially with their neighbors, but are actually harboring malice (Ps. 28:3). Sometimes the OT writer observes that the mouth of the evil person is both deceitful and wicked (Ps. 36:3-4; 41:6). At times the word appears parallel with other generally negative modes of communication, including the concept of boasting (Ps. 94:4), a corrupt mouth (Prov. 6:12), lying (Prov. 17:4), and a false witness (Prov. 19:28). Fourth, the word often signifies “evil doers” (or “workers of iniquity” in the KJV). The psalmist observes that evil people, who do not call upon the name of the Lord, never learn (Ps. 14:4; 53:4). Often the psalmist requests God’s help against evildoers (Ps. 59:2, 5; 64:2; 94:16; 141:9), who will eventually be destroyed altogether (Ps. 92:7, 9; 125:5; Prov. 10:29). In the meantime, David pledged to do all he could to eliminate evildoers from the land (Ps. 101:8). The term signifies “evildoers” about 20 times. Finally, ʾāwen points to idolatry. In 1 Sam. 15:23, the prophet likens Saul’s rebellion and arrogance to divination and idolatry. In Isaiah, the idolatrous condition of the Israelites made their assemblies evil to God (1:13). Later, idolaters’ deeds amount to nothing, just as their images are but wind (Isa. 41:29). In Zechariah, idols speak deceit, diviners see visions that lie, and tell false dreams (10:2). Thoralf Gilbrant, ed., “201,” in The Complete Biblical Library Hebrew-English Dictionary – Aleph-Beth, (Springfield, IL: World Library Press, Inc., 1998), WORDsearch CROSS e-book, Under: “201”. . The feminine noun rāʿāh, “evil,” “wickedness,” “wrong,” “disaster,” comes from rāʿaʿ (HED #7778), “to be bad,” “to be evil,” and appears over 300 times in the OT. Its range of meaning is similar to the masculine noun raʿ (HED #7737). Both these nouns are also sometimes used as adjectives. While English draws a fairly sharp distinction between moral evil and physical imperfection or calamity, the Hebrew vocabulary blends the two. Similarly, the term can apply both to misfortunes received passively and to evil performed actively. In many passages, the context must determine the emphasis. The foundational concept of the word group to which rāʿāh belongs is a description of something that is the opposite of good. Indeed, it is often used in contrast to tôv (HED #3005), “good” (e.g., Num. 13:19). The term can describe physical harm or spiritual and ethical departure from the ideal. Since good or bad must be determined on the basis of some standard, rāʿāh is often followed by expressions declaring something evil “in the eyes of the Lord“ (e.g., 1 Sam. 12:17). The term sometimes simply describes things of inferior quality. For example, land can be worthless (Num. 13:19). The noun can be used to describe actions which are not morally acceptable, but are wicked and morally evil (Job 20:12; Prov. 26:26). As one might expect, the term is used to describe many of the individuals and nations of the OT. David (2 Sam. 12:11) using this noun. Gentile nations such as Assyria (Jon. 1:2; Nah. 3:19) and Syria (1 Ki. 20:7) received a verdict of evil. So did groups within Israel such as Joseph’s brothers (Gen. 50:15, 17) and the tribe of Benjamin (Judg. 20:3, 12). Sometimes rāʿāh is used as an adjective to describe people (Num. 14:27, 35; Jer. 8:3) or thoughts (Ezek. 38:10). In other cases, it serves as a summarization of a person’s actions or attitudes. Several passages speak of evil angels, not in the ethical sense, but as carriers of calamity (Judg. 9:23; 1 Sam. 16:14ff, 23; 18:10; 19:9). The word can also be used as a description of disaster which happens to a person, often as the harmful consequences of wrong actions. Since God is sovereign over all persons and events, these distressing circumstances may be described as coming from God. and upon Israel itself (Deut. 31:29; Judg. 20:34, 41; 2 Sam. 17:14; 1 Ki. 22:23). Moral evil is described as sinful (Gen. 39:9; Judg. 11:27; 1 Sam. 12:19; 24:11) and perverse (Prov. 16:30). Because God is holy, He is angered by those who continue to participate in evil (Jer. 49:37), resulting in disaster (Ps. 91:10) and death (1 Ki. 1:52). Thoralf Gilbrant, ed., “7750,” in The Complete Biblical Library Hebrew-English Dictionary – Pe-Resh, (Springfield, IL: World Library Press, Inc., 1998), WORDsearch CROSS e-book, Under: “7750”. underscores the certainty of divine promises being pure, like “silver tried in a furnace of earth, purified seven times” (v. 6). The significance of the number seven is that it denotes divine perfection. Similarly, in S.S4:16, the male compares his beloved to a locked garden and longs for a breeze to blow the scent of the garden to him. An extension of blowing is found in the euphemism that daylight blows shadows away (2:17; 4:6). as the arrogant puff in the face of their foes (Ps. 10:5). In a warning about recognizing the timing of prophetic visions, Habakkuk asserts that visions “blow on to the end,” expressing the concept of continuous progression (Hab. 2:3). Thoralf Gilbrant, ed., “6558,” in The Complete Biblical Library Hebrew-English Dictionary – Pe-Resh, (Springfield, IL: World Library Press, Inc., 1998), WORDsearch CROSS e-book, Under: “6558”. Kāzāv is used to label idols (Amos 2:4). Likewise, humans are an unstable, deluding source of hope, especially in contrast to Yahweh as a source of strength, support and hope (Isa. 28:17; Ps. 62:9). False witnesses are characterized by kāzāv (Prov. 21:28). Likewise, the messages of false prophets fail to correspond with reality, and thus are lies (Ezek. 13:7; 13:9, 22:28). Deceptiveness in an attempt to secure material gain is a sin (Ps. 5:4ff). Those who engage in cheating customers are referred to as “lying men” (Prov. 19:22). Thoralf Gilbrant, ed., “3695,” in The Complete Biblical Library Hebrew-English Dictionary – Kaph-Mem, (Springfield, IL: World Library Press, Inc., 1998), WORDsearch CROSS e-book, Under: “3695”. Found about seventy times in the OT, ʿﬁdh, which means “witness,” is derived from the verb ʿûdh (HED #5967), “to surround,” “to testify.” It is attested in Syriac and Middle Hebrew. About fourteen times, ʿﬁdh signifies a thing that functions as a witness. A heap of stones served as a symbol of a peace pact between Jacob and Laban (Gen. 31:44, 48, 50, 52). According to the Law, when a person had in his possession a neighbor’s animal that had been killed by a wild animal, he could present the dead animal to the officials as evidence (Exo. 22:13). Moses’ song (Ha’azinu) served as a reminder to Israel, a people who were prone to disregard the Covenant (Deut. 31:19, 21). Deuteronomy 31:19 (CJB) 19 “Therefore, write this song for yourselves, and teach it to the people of Isra’el. Have them learn it by heart, so that this song can be a witness for me against the people of Isra’el. The Book of the Law was placed alongside the Ark as a witness (v. 26). An altar erected east of Jordan by the three tribes served as a memorial, bringing to mind their obligation to those on the other side. They should not neglect Israel’s faith and Covenant (Josh. 22:27f, 34). Job falsely saw his physical condition in terms of a witness or proof that God was against him (Job 16:8). The courses of the moon are an enduring witness that God will keep his covenant with David (Ps. 89:37). Otherwise, ʿﬁdh refers to persons, including God, who have firsthand knowledge concerning the truth or falsity of a thing. The term is most often used with regard to legal matters and in deciding cases. A witness is required to testify on the basis of what he has seen and has knowledge of. When he fails to come forth to do so, he himself is considered responsible (Lev. 5:1). A reliable witness is one whose character is such that he can be counted on to clarify an issue when there is doubt (Isa. 8:2). Isaiah 8:2 (CJB) 2 I had it witnessed for me by reliable witnesses— Uriyah the cohen and Z’kharyahu the son of Y’verekhyahu. False testimony is specifically prohibited in the Decalogue (Exo. 20:16). Exodus 20:16 (CJB) 16 ‏ט‎ (16) “Do not give false evidence against your neighbor. According to the Torah, a person who lied, having malicious intent toward another, would be liable for the same punishment the innocently accused would have received (Deut. 19:16, 18f). His guilt would be determined by the judges on the basis of the evidence (v. 18). More than one witness would be required, particularly with respect to a capital case (Deut. 17:6; 19:15). Regarding the purchases and sales of land, witnesses constituted an assurance that the transaction had occurred and was legitimate. Boaz availed himself of his kinsman redeemer right and obligation in the presence of witnesses at the city gate (Ruth 4:9ff). Jeremiah purchased land, weighing out the money in the presence of witnesses (Jer. 32:10, 12, 25). This prophetic action was a testimony that the people would return from exile and again possess the land (Jer. 32:44). Yahweh alone is the true and faithful Witness (Jer. 42:5). Jeremiah 42:5 (CJB) 5 They said to Yirmeyahu, “May Adonai be a true and faithful witness against us if we fail to do any part of what Adonai your God gives you to tell us. Consequently, in difficult cases, appeal was made to Him. When a husband thought his wife to be unfaithful, the ritual performed by the priest was an application of this conviction (Num. 5:13). Numbers 5:11-31 (CJB) 11 (A: iv) Adonai said to Moshe, 12 “Tell the people of Isra’el, ‘If a man’s wife goes astray and is unfaithful to him; 13 that is, if another man goes to bed with her without her husband’s knowledge, so that she becomes impure secretly, and there is no witness against her, and she was not caught in the act; 14 then, if a spirit of jealousy comes over him, and he is jealous of his wife, and she has become impure — or, for that matter, if the spirit of jealousy comes over him, and he is jealous of his wife, and she has not become impure — 15 he is to bring his wife to the cohen, along with the offering for her, two quarts of barley flour on which he has not poured olive oil or put frankincense, because it is a grain offering for jealousy, a grain offering for remembering, for recalling guilt to mind. 16 The cohen will bring her forward and place her before Adonai . 17 The cohen will put holy water in a clay pot, and then the cohen will take some of the dust on the floor of the tabernacle and put it in the water. 18 The cohen will place the woman before Adonai, unbind the woman’s hair and put the grain offering for remembering in her hands, the grain offering for jealousy; while the cohen has in his hand the water of embitterment and cursing. 19 The cohen will make her swear by saying to her, “If no man has gone to bed with you, if you have not gone astray to make yourself unclean while under your husband’s authority, then be free from this water of embitterment and cursing. God was fully cognizant of Israel’s sins. Judgment was imminent (Jer. 29:23). The Lord sees social injustices and false religious practices (Mal. 3:5). He called upon his covenant people to be a witness (Isa. 43:10, 12). Thoralf Gilbrant, ed., “5915,” in The Complete Biblical Library Hebrew-English Dictionary – Nun-Ayin, (Springfield, IL: World Library Press, Inc., 1998), WORDsearch CROSS e-book, Under: “5915”. 7: and him who sows strife among brothers. and three times it is used to denote a “contentious” wife (Prov. 21:19; 25:24; 27:15). It is also used of the “contentious” person (Prov. 26:21). their sin (Ps. 80:6), and Jeremiah became an object of contention in his own land because of his preaching (Jer. 15:10). Proverbs 6:14 (CJB) 14 With deceit in his heart, he is always plotting evil and sowing discord. Proverbs 6:19 (CJB) 19 a false witness who lies with every breath, and him who sows strife among brothers. Proverbs 16:28 (CJB) 28 A deceitful person stirs up strife, and a slanderer can separate even close friends. Proverbs 10:12 (CJB) 12 Hate stirs up disputes, but love covers all kinds of transgressions. Proverbs 15:18 (CJB) 18 Hot-tempered people stir up strife, but patient people quiet quarrels. Proverbs 28:25 (CJB) 25 A grasping disposition stirs up strife, but he who trusts in Adonai will prosper. Proverbs 29:22 (CJB) 22 Angry people stir up strife; hot-tempered people commit many crimes. as being foolish and headed for judgment. This word is used in parallelism with rîv (HED #7663), “lawsuit” (Prov. 15:18; Jer. 15:10; Hab. 1:3), and dîn (HED #1835), “legal case” (Prov. 22:10). Thoralf Gilbrant, ed., “4209,” in The Complete Biblical Library Hebrew-English Dictionary – Kaph-Mem, (Springfield, IL: World Library Press, Inc., 1998), WORDsearch CROSS e-book, Under: “4209”. This entry was posted in Word Studies and tagged 6 things, 7 things, abomination, hates, MOST IMPORTANT COMMAND. Bookmark the permalink.